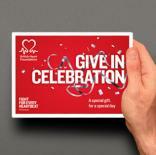 A staggering 25% of the UK’s research into cardiovascular disease is funded through gifts in Wills, left to the BHF. And when these conditions still kill 1 in 4 people, this income couldn’t be more important – quite simply, legacy gifts to the BHF will have an impact on every one of us. But many of the BHF’s staff didn’t feel comfortable talking about gifts in Wills to supporters – a serious barrier to growing this most vital of income streams. 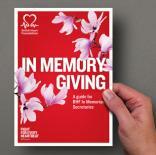 We needed to create an attention-grabbing, informative and above all inspiring internal communications campaign, with one aim: to galvanise the BHF’s supporter-facing staff to talk gifts in Wills with confidence. We created a comprehensive suite of materials, giving staff a wealth of information and inspiring stories about gifts in Wills. From handy pocket guides to screensavers and stress toys, we made sure the incredible impact of gifts in Wills became an integral part of daily life at the BHF. We used insight from interviews and workshops to develop a proposition: ‘Talk Gifts in Wills’, which united every element of this campaign. 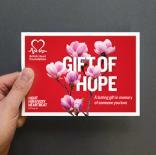 Over the coming months and years, supporter-facing teams at the BHF will be drip-fed more emotive case studies and compelling facts about legacy giving – making persuading people to leave a gift in their Will a joy. Our materials have been used to deliver inspirational training to BHF teams across the country – and 100% of attendees have agreed that the materials we’ve delivered will help them talk confidently about gifts in Wills to supporters. It’s too early to see an impact on legacy pledges, but the campaign has made a splash at the BHF – so much so that we’re planning a bigger and better round two in the year ahead. And with this much excitement around gifts in Wills, there’s sure to be an uplift in income – which means more life-changing impact on conditions that cause so much heartbreak. That’s something we’re truly proud about.